Traditional narratives insist that the fourth quarter is the most important time of the year for retailers. 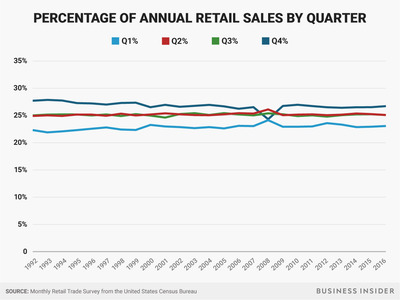 But just 26.73% of US retail sales occurred in the fourth quarter in 2016, and that number hasn’t exceeded 27.88% since 1992. Fourth-quarter retail myths persist because it’s the only time of the year when everyone’s gift-giving schedules align, so it feels like everyone is shopping more than they actually are. The fourth quarter is the most important time of the year for retailers. And as traditional, brick-and-mortar-based companies struggle to pay down debt and adapt to innovative competitors like Amazon, the holiday season is their only break from the damage they absorb during the spring and summer. 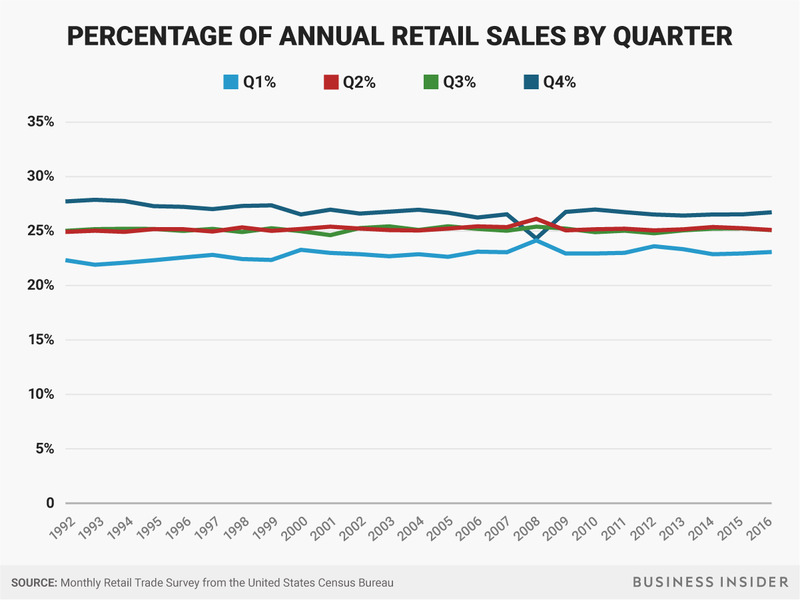 While traditional narratives would insist otherwise, it turns out that the fourth quarter is not much busier than the rest of the year for the retail industry. In fact, by some measures, its importance has declined over the past 25 years. In 2016, 26.73% of US retail sales occurred in the fourth quarter, down from 27.72% in 1992, 24 years prior. And while that number has exceeded 25% in 23 of the past 24 years, it hasn’t risen above 27.88%. This means that, even as the internet and smartphones have revolutionised the way we shop, the seasonal timing of our purchases hasn’t changed much. Since 1992, we’ve reallocated about 1% of our Q4 retail budgets, most of which has gone to the first quarter, where the percentage of annual retail sales has increased from 22.33% to 23.08%. 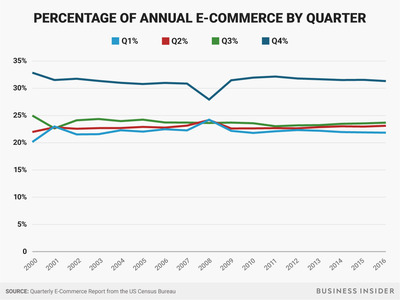 What makes this fact more surprising is that since the US Census Bureau began tracking e-commerce, we’ve done about a third of our online shopping in the fourth quarter each year. 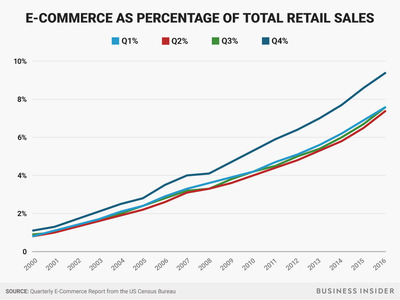 And while e-commerce is still a small percentage of total retail sales, it’s expanded at a rapid pace since 2000. 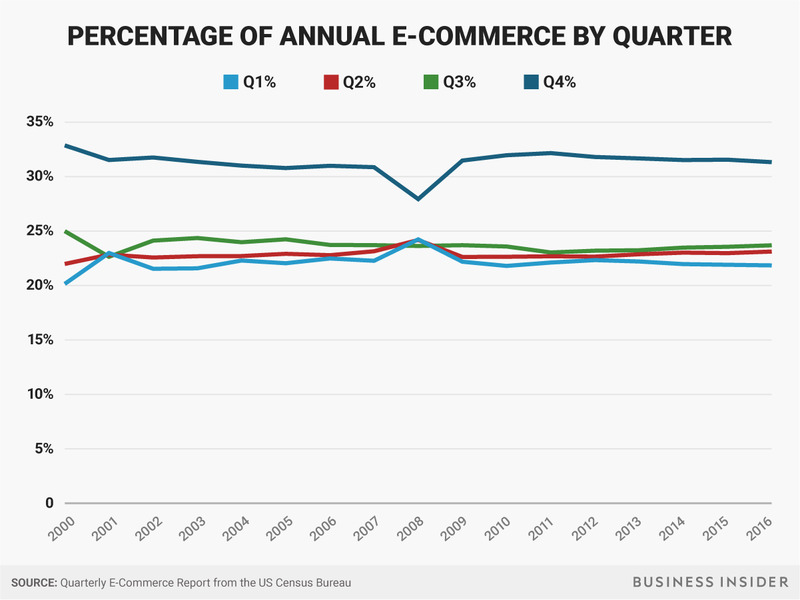 Given that e-commerce spending has increased most in the fourth quarter, it would be reasonable to expect a slight increase in the percentage of total, fourth-quarter retail sales. But that hasn’t happened. In fact, some of the businesses that are most reliant on holiday spending have seen the largest negative trend in the percentage of annual sales that occur in the fourth quarter. 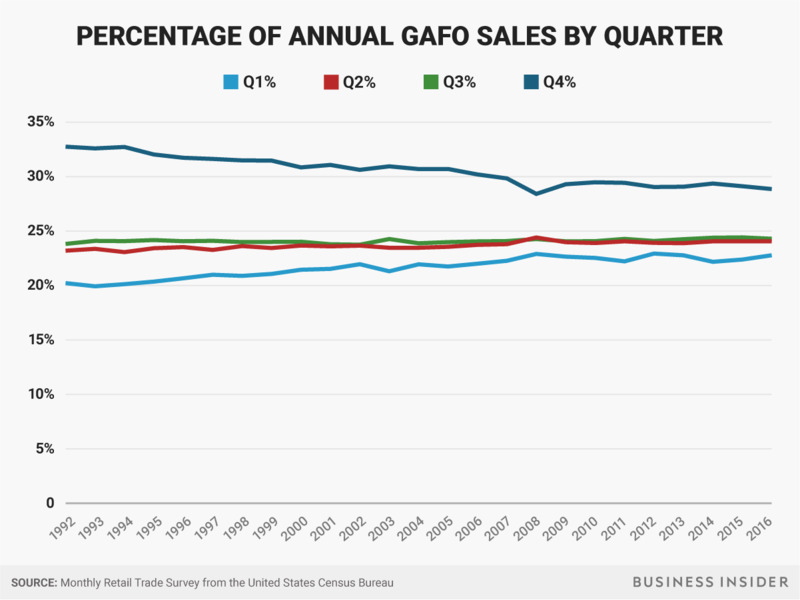 GAFO stands for “general merchandise, apparel and accessories, furniture and other sales,” which includes many of the products we most often associate with holiday spending, like clothes, electronics, books, and greeting cards. 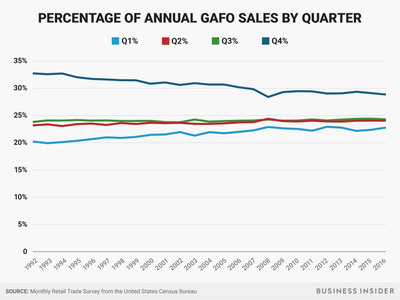 But in 2016, 28.86% of annual GAFO sales occurred in the fourth quarter, down 3.89% since 1992 and 1.99% since 2000. This leads to a strange paradox: As e-commerce takes on a larger role in the retail industry, the businesses that receive the most attention during the holidays have become less reliant on fourth-quarter revenue. Why has this happened? And why do fourth-quarter myths persist? The answer to both has something to do with the narratives Americans receive and create around spending. Americans are often most focused on spending during the holidays – when they have to buy gifts for more people than at any other time during the year – and are less focused during the rest of the year, when there isn’t a seasonal narrative to explain their spending. From birthday and wedding gifts to household goods like toothpaste and soap, consumers spend plenty of money at retailers year-round. But they’re never made to believe these purchases have any specific, collective significance. And given that retailers have trained consumers to buy everything on sale, they have been forced to offer discounts throughout the year. This means that shoppers don’t feel the need to wait to make big purchases the way they might have in the past. If you’re looking for a new, flat-screen TV, chances are you can find one at a significant discount within 10 minutes of searching online, no matter when you’re searching. So why do many still think that shoppers do most of their retail spending during the fourth quarter? Because everyone is doing the same kind of spending at the same time. There are plenty of special occasions that require gifts throughout the year, but the fourth quarter is the only time when everyone’s gift-giving schedules are aligned. Families, friends, co-workers, and news providers can’t stop talking about all of the shopping you have to do between Thanksgiving and Christmas, so retail spending stays front-of-mind before, during, and after the holiday season. Which means, that strain you start to feel on your wallet after summer ends? It’s all in your head.